30.51917 Trenches: Draft of 24 other ranks arrived as reinforcements. 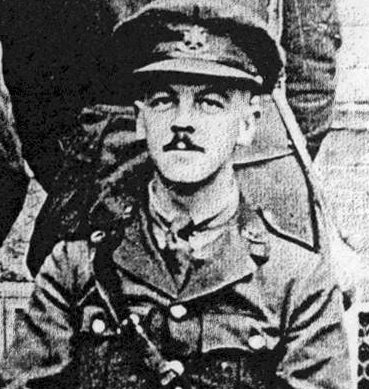 30.5.1917 Trenches: Lieut GKK MAUGHAN rejoined from short leave to England. MARQUEFFLES FARM was next to MARQUEFFLES coal mine at the foot of the Northern slopes of the Lorette Ridge. The Companies were all billeted in the farm, and the Officers in tenet outside, while a home made marquee was used as a mess. This entry was posted in Honours and Awards, On this day, Reinforcements and tagged 2305/240513 Sergeant Frank Longson, 3004/242442 Pte Leslie BEASTALL, 4113/241360 Pte Albert Evans, Gardyne Keith Kilgour Maughan, Lorette Ridge, MARQUEFFLES coal mine, MARQUEFFLES FARM, Victor Owen Robinson on May 30, 2016 by mikebriggs1910. 21.5.1917 PETIT SAINS: Draft of 21 other ranks arrived as reinforcements. May 21-24 Rest: No change. Time devoted to close order Ceremonial and Attack drill. Two Battalions employed on wiring the “CRASSIER SWITCH” Line and on working for 137 Bde. Service Record for 1729/240235 Pte Thomas Beswick recording his arrival in France with the 33rd Reinforcement, which had embarked from Folkestone on the 6th April 1917. Tom was a quarryman from Peak Dale who worked at the Buxton Lime Firm. He was a Pre-War Territorial who enlisted in September 1914 aged 18 and served with “B” (Chapel-en-le-Frith) Company. 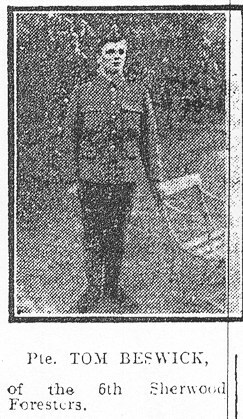 Tom arrived in France with the 46th Division in February 1915 and returned to England in October 1916 suffering from sycosis. Tom was finally disembodied on the 24th February 1919. This entry was posted in On this day, Reinforcements and tagged 1729/240235 Pte Thomas Beswick, 33rd Reinforcement, CRASSIER SWITCH on May 21, 2016 by mikebriggs1910. 7.2.1917 HALLOY: 160 other ranks joined Battalion from Brigade Depot. This entry was posted in On this day, Reinforcements on February 7, 2016 by mikebriggs1910. 7.1.1917: Relieved 5th Battalion in RIGHT SECTOR. Draft of 180 Other Ranks (160 partly trained) joined Battalion and sent to 139 Brigade Training Depot. 80 of these men comprise the 28th Reinforcement (see below), but the origin the of the other 100 men is not clear. 7th: 6th and 8th Battalions take over the front line. Some of these these men came from the 14th Infantry Base Depot and formed the 28th Reinforcement to the 1/6th Battalion. This Reinforcement comprised many men from the South Nottinghamshire Hussars (left) and Derbyshire Yeomanry (right). Army Service Record for 7804/242592 Pte Percy McNeil recording that he had left Folkstone on the 4th January 1916 and had been posted to the 14th Infantry Base Depot before transferring to the 1/6th Battalion Sherwood Foresters. Percy had originally enlisted into the South Nottinghamshire Hussars on the 22nd August 1914 and embarked for Gallipoli (via Alexandria) in August 1915. He was taken sick with enteritis and dysentery and returned to England on Hospital Ship FORMOSA in February 1916. After treatment and recuperation he was transferred to the 5th Reserve Battalion Sherwood Foresters before disembarking from Folkestone for Boulogne in January 1917. Army Service Record for 669 Pte John Atkinson of ‘D Squadron’ 1/1st South Nottinghamshire Hussars who also transferred to the 5th battalion Sherwood Foresters on the 2nd January 1917, two days before leaving for France. This entry was posted in On this day, Reinforcements, Trench duty and tagged 139 Brigade Training Depot., 28th Reinforcement, 669 Pte John Atkinson, 7804/242592 Pte Percy McNeil, Derbyshire Yeomanry, South Nottinghamshire Hussars on January 7, 2016 by mikebriggs1910. 24.2.1916 TRENCHES: Draft of 40 other ranks from base (25 other ranks old 7th Battalion and 15 other ranks old 8th Battalion). This entry was posted in On this day, Reinforcements on December 24, 2015 by mikebriggs1910. 16.9.1916 BAILLEUVAL: Draft of 22 other ranks arrived. 16th: The enemy were being quite all days – making no reply to our short bombardment of the BLOCKHOUSE at 4pm. This entry was posted in On this day, Reinforcements and tagged BLOCKHOUSE on September 18, 2015 by mikebriggs1910. 28.8.1916 TRENCHES: Relieved 5th Battalion in RIGHT SECTOR. 28.8.1916 TRENCHES: Draft of 11 Signallers and 15 Lewis Gunners arrived. Amongst the men that arrived in the draft (part of the 17th Reinforcement) was 3276 Pte John Rupert Pidcock (1894-1968) a gardener from Darley Dale near to Matlock. John was granted Proficeny Pay Class I on the 1st July 1917. He was later transferred to the Labour Corps. 28th: 6th Battalion relieved the 5th in the RIGHT SECTOR & 8th Battalion relieved the 7th in the LEFT SECTOR. A few shells fired into GROSVILLE during the evening. This entry was posted in Reinforcements, Trench duty and tagged GROSVILLE, Lewis Gunners, Signallers on August 28, 2015 by mikebriggs1910.